In defense of picture books—and other childish things. Is it true that children’s picture books are going out of fashion? “Parents are saying, ‘My kid doesn’t need books with pictures anymore.’ ” That’s what Justin Chanda, publisher of children’s books at Simon & Schuster, explained to a New York Times reporter the other day. Whatever the kids may be thinking, the thinking of their parents is all too easy to understand. In our test-score crazed culture, pictures are seen as a waste. Why linger over a farmland vista or a knight in shining armor or one of Richard Scarry’s crazy traffic jams when there’s real work to be done? Why drift along, filling your eyes with all these differently shaped and colored and articulated images, when you could be doing something useful, like learning to spell a new word or figuring out the answer to an especially difficult arithmetic problem? I will leave to the educators the battle to save the picture book. This discussion is about much more than education policy. It’s a symptom of an epochal argument about the nature and future of modernity—and modernity’s core belief in the majesty of the imagination. In The Banquet Years, that hymn to the genius of early twentieth-century Paris, Roger Shattuck writes that “starting long before Freud, a mood developed which re-examined with a child’s candor our most basic values: beauty, morality, reason, learning, religion, law. With Rimbaud a new personage emerges: the ‘child-man,’ the grownup who has refrained from putting off childish things. Artists became increasingly willing to accept the child’s wonder and spontaneity and destructiveness as not inferior to adulthood.” And it is this extraordinarily sophisticated faith in the importance of childish things that is at risk when adults announce that they want no more picture books. 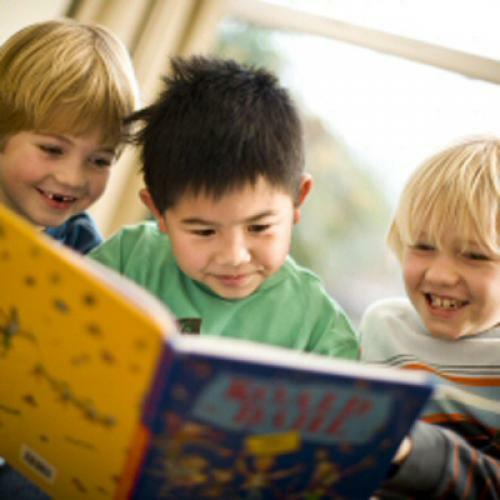 Why should kids be encouraged to linger over picture books? The answer is simple. When children look at pictures—and daydream with pictures—they discover that seeing is a kind of knowing. The eye plays with the images and the imagination is thereby sharpened, refined. For Miró, Steen’s dark-toned, crowded interiors must have had some of the fantastical fascination that certain highly detailed picture books have for children. And what Miró did with his variations on Jan Steen is really just an infinitely subtler version of what kid’s do when they contemplate the illustrations in a favorite book. The picture is a jumping off point for the free play of the imagination. Children love to weave stories around pictures, and sometimes their stories confound the author’s and the illustrator’s intentions—which is all to the good. The child is reimagining the story. That’s precisely what Miró was doing in his studio after his return from Amsterdam. The lute player’s face became a grimacing red planet. The white tablecloth became a quivering amoeba. 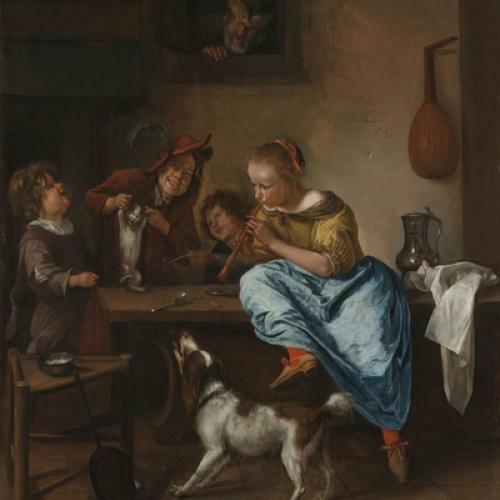 Gravity was confounded, domesticity was disassembled, and a new kind of gleefully discombobulated narrative emerged from the coziness of Dutch domestic life. Taken together, Miró’s three Dutch interiors are a picture book for adults. They’re hanging in New York right now, even as parents, booksellers, publishers, and educators argue about the future of the picture book.